Sadly puppy farms are a reality in South Africa. Don't you just hate it when you are exposed in your local newspaper! Well done Highveld Tribune! All the little schnauzers who were not even mentioned or acknowledged in the half baked excuse for an "apology" are wagging their tails. The Highveld Tribune is a weekly newspaper and has a circulation of 20000 copies in the Mpumalanga areas of Ermelo, Amersfoort, Breyten, Chrissiesmeer, Amsterdam, Lothair, Sheepmoor, Carolina, Mayflower and Davel. Click here for more info about the rescue project. The Highveld Ridge SPCA recently seized 76 miniature Schnauzers from the Roodewal Kennels, here in Ermelo. 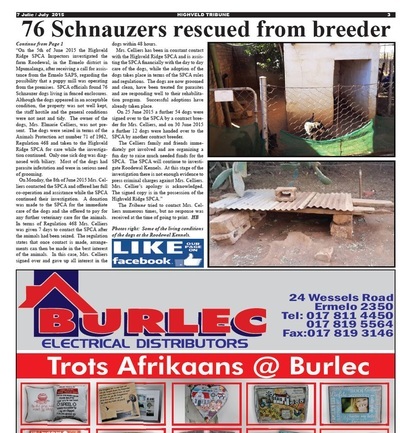 An article in the Beeld, as well as an article published by the SPCA on www.sandtonspca.org.za, clearly highlighted the terrible conditions these defenseless animals were living in. “The dogs were found in appalling conditions. They were living in wire cages and slept in rat infested holding areas. The kennels was found to be filthy and some of the dogs were sleeping in their own feces. While being kept as breeding machines, the dogs were found to have many ailments and illnesses due to the lack of care, typical of a puppy mill. Schnauzer friends South Africa assisted the SPCA in identifying this horrific situation,” stated the SPCA article. 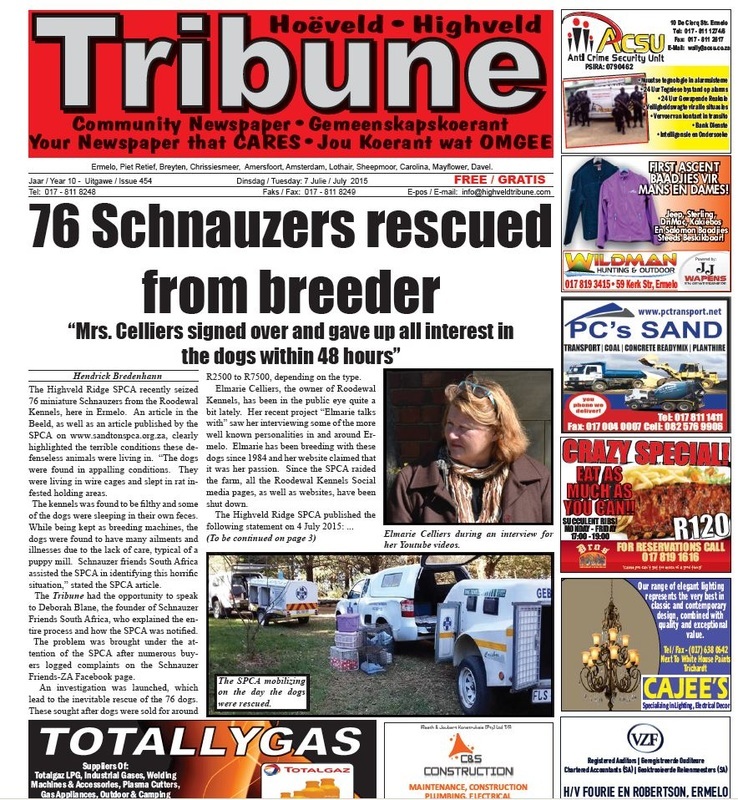 The Tribune had the opportunity to speak to Deborah Blane, the founder of Schnauzer Friends South Africa, who explained the entire process and how the SPCA was notified. The problem was brought under the attention of the SPCA after numerous buyers logged complaints on the Schnauzer FriendsZA Facebook page. An investigation was launched, which lead to the inevitable rescue of the 76 dogs. These sought after dogs were sold for around R2500 to R7500, depending on the type. Elmarie Celliers, the owner of Roodewal Kennels, has been in the public eye quite a bit lately. Her recent project “Elmarie talks with” saw her interviewing some of the more well known personalities in and around Ermelo. Elmarie has been breeding with these dogs since 1984 and her website claimed that it was her passion. Since the SPCA raided the farm, all the Roodewal Kennels Social media pages, as well as websites, have been shut down. The Highveld Ridge SPCA published this statement on 4 July 2015: “On the 5th of June 2015 the Highveld Ridge SPCA Inspectors investigated the farm Roodewal, in the Ermelo district in Mpumalanga, after receiving a call for assistance from the Ermelo SAPS, regarding the possibility that a puppy mill was operating from the premises. SPCA officials found 76 Schnauzer dogs living in fenced enclosures. Although the dogs appeared in an acceptable condition, the property was not well kept, the staff hostile and the general conditions were not neat and tidy. The owner of the dogs, Mrs. Elmarie Celliers, was not present. The dogs were seized in terms of the Animals Protection act number 71 of 1962, Regulation 468 and taken to the Highveld Ridge SPCA for care while the investigation continued. Only one sick dog was diagnosed with biliary. Most of the dogs had parasite infestation and were in serious need of grooming. On Monday, the 8th of June 2015 Mrs. Celliers contacted the SPCA and offered her full co-operation and assistance while the SPCA continued their investigation. A donation was made to the SPCA for the immediate care of the dogs and she offered to pay for any further veterinary care for the animals. In terms of Regulation 468 Mrs. Celliers was given 7 days to contact the SPCA after the animals had been seized. The regulation states that once contact is made, arrangements can then be made in the best interest of the animals. In this case, Mrs. Celliers signed over and gave up all interest in the dogs within 48 hours. Mrs. Celliers has been in constant contact with the Highveld Ridge SPCA and is assisting the SPCA financially with the day to day care of the dogs, while the adoption of the dogs takes place in terms of the SPCA rules and regulations. The dogs are now groomed and clean, have been treated for parasites and are responding well to their rehabilitation program. Successful adoptions have already taken place. 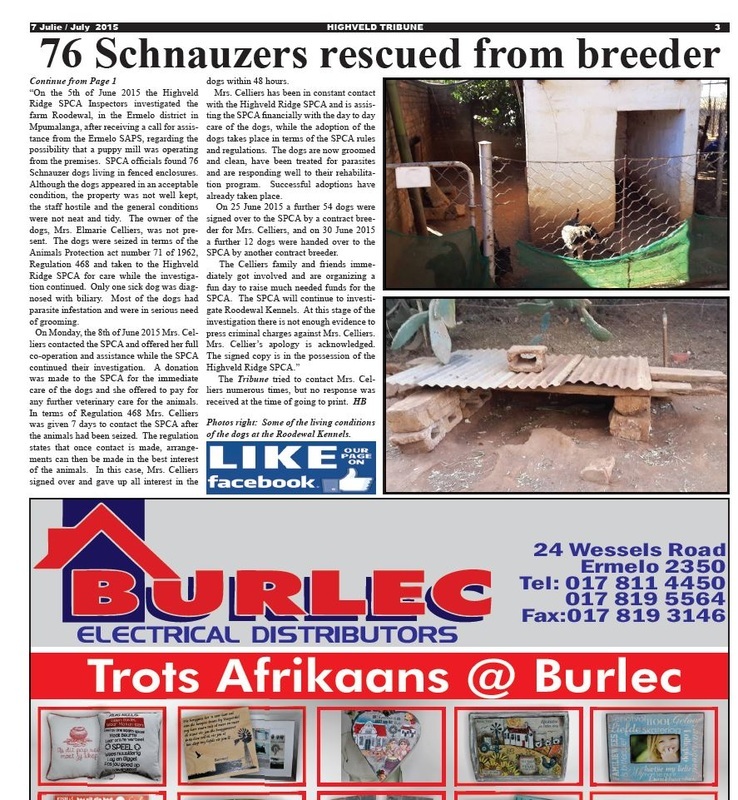 On 25 June 2015 a further 54 dogs were signed over to the SPCA by a contract breeder to Mrs. Celliers, and on 30 June 2015 a further 12 dogs were handed over to the SPCA by another contract breeder.